Dandruff is a very common skin problem for a lot of people, and it is an issue that may not only happen in your head but also in the eyebrows, eyes, and nose. This condition is caused by a fungus called Malassezia and it results to dry, flaky, and itchy skin. Dandruff can get worse when you are stressed and when you are living in a location where the winter season is not only cold but also dry. Although this condition is completely harmless, it can be embarrassing for some especially when the white flakes from your hair drop on your shoulders and when you need to frequently scratch your head because of the itch. Further, it’s a condition that has no cure; if you are prone to dandruff, all you can do is use medicated shampoos and conditioners to control the issue. If you have a dandruff problem, one of the effective shampoos on the market that you can use is the Redken Dandruff Control Shampoo. Read on to learn more about its highlights and drawbacks. It’s very effective in removing dandruff. Unlike most dandruff shampoos, this product leaves hair and scalp moisturized. It does not strip hair color. It improves the health of your hair. This anti-dandruff shampoo works great with people who have dermatitis on the scalp. It helps relieve hair fall problems. It can be harsh for users with a highly sensitive scalp. The Redken Dandruff Control Scalp Relief Shampoo is dermatologist-tested to be safe. Its main ingredient is pyrithione zinc which is known to be effective in removing dandruff and its symptoms like itching and flaking. It also has lavender extracts to clarify and soothe and glycerin to keep scalp and hair moisturized. Moreover, this anti-dandruff shampoo uses the interbond scalp system so that its ingredients are broken apart upon application and binds to the hair and scalp to target the issues. Unlike other dandruff shampoos that will leave your hair dull and lifeless, the Redken Dandruff Control Scalp Relief Shampoo is different because it will leave your hair shiny and healthy after each use. Redken Dandruff Control Scalp Relief Shampoo is so effective that you will see results in the first wash and, although it’s specially designed for oily hair, this shampoo should work of types and textures of hair. Similar to the Redken Dandruff Control Scalp Relief Shampoo, the Neutrogena T/Gel Therapeutic Shampoo Original Formula also uses pyrithione zinc to help relieve dandruff and its symptoms. Both of these shampoos will show results even on the first wash; moreover, they are both dermatologist-tested. Like the Redken anti-dandruff shampoo, this one also works for all types of hair and textures. As for their differences, the Neutrogena T/Gel Therapeutic Shampoo Original Formula does not have that great smell that the other shampoo has. This Neutrogena anti-dandruff shampoo uses salicylic acid to clarify the scalp, while the Redken uses lavender extracts. In addition, this shampoo does not have moisturizing ingredients, unlike the Redken Dandruff Control Scalp Relief Shampoo. Finally, the Neutrogena T/Gel Therapeutic Shampoo Original Formula is specifically designed to be an anti-dandruff shampoo, so shine and body on your hair should not be expected when this is used. The Redken Dandruff Control Shampoo is a great shampoo for relieving dandruff symptoms because you will see results at the first wash. It also has ingredients that will leave your hair moisturized, clean and shiny while keeping your hair free from dandruff. This dermatologist-tested, safe shampoo can also be for you if you have color treated hair and have a dandruff problem due to that fact that it will not strip away your hair color. Unlike other shampoos with an overwhelming chemical scent, another major plus of this product is its great smell. 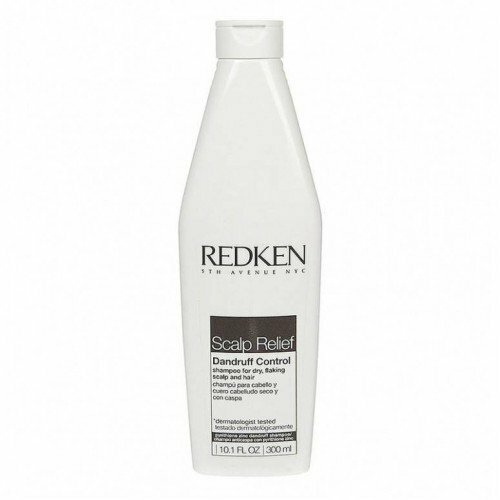 Overall, we highly recommend Redken Dandruff Control Scalp Relief Shampoo. This product will make your hair full of life, moisturized, clean and super shiny that no one will think that you are using an anti-dandruff shampoo.